clean, minimal. good value for the price. good location. sweet pocket park across the street. Computer was down so couldn’t fully check in. Can’t control heat. Great location!!!! Clean hotel!!! We will stay there again for sure!!! In 9 minutes by walk you will find Whole Foods, in 1 min by walk you will find lots of cafes and some small grocery stores. The rooms are a perfect size for 2 people, beds are so comfy and everyone there was so nice and helpful !! Excellent hotel. The location was perfect. I'm certainly going back. Everything besides the communal restroom/showers were fantastic! I think this is the only Pod that doesn't offer private restrooms on bunk bed suites but I could be wrong. You do get accustomed to it though. Nice and clean room in great location my room is small but convenient and it has a window that overlooks Manhattan. Awesome choice, great location, all you need for a great price! I loved my little bunk bedroom, and had no problems with the shared bathroom - it was actually great. It still had a sink in the room for brushing my teeth or washing my hands in a hurry. Loved it! I did not like having to share a bathroom. When I had to get up in the middle of the night to go, it was annoying to dress and put on shoes and find my key to take down the hall. Also, for showering, hauling my items down the hall was inconvenient and I wasn’t too keen on standing in someone else’s dirty bath water. The heat was an old boiler system which could not be set to an exact temperature. It was extremely difficult to regulate the temperature and we would go from freezing to sweating. It took about 15 minutes to come on after setting. Not fun after coming in from the snow. The room was super clean and the staff was very nice. They are able to hold your luggage if you have to check out before your flight leaves. They have a small snack bar downstairs and a restaurant attached next door. Great location two blocks from subway. Nice cafe in the lobby for a good simple breakfast (yogurt, fruit and granola, bagel, coffee , juice). Room is small but clean and perfect for an overnight stay. We did the shared bath option and it was fine. There is a light panel in the room that shows which bathrooms are unoccupied. Pod 51 places you in Midtown, within a leisurely stroll of popular sights such as 5th Avenue and St. Patrick's Cathedral. This 348-room, 3-star hotel has a restaurant, free in-room WiFi, and a rooftop terrace. You can enjoy a drink at the bar/lounge or visit the onsite restaurant for a bite to eat. Get a pick-me-up at the coffee shop/café. For your convenience, breakfast is available for a fee. A 27-inch LCD TV comes with digital channels, and guests can stay connected with free WiFi and wired Internet. Beds sport premium bedding and the bathroom offers a hair dryer and free toiletries. Other standard amenities include a safe, a phone, and a desk. 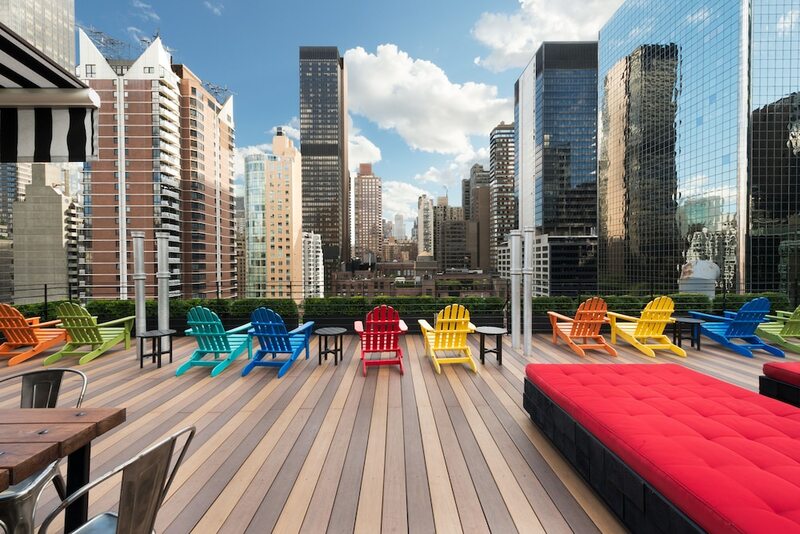 Guests of Pod 51 enjoy a rooftop terrace, free WiFi in public areas, and conference space. Self parking is available for USD 35 per night. Multilingual staff at the 24-hour front desk can assist with luggage storage, concierge services, and dry cleaning/laundry. Additional amenities include free newspapers, a garden, and a porter/bellhop. The front desk is open 24 hours a day. Driving? This property offers parking (fees apply).